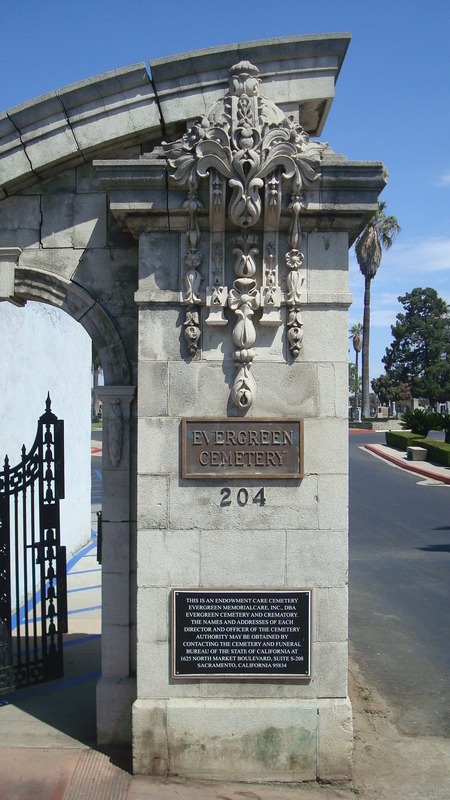 I first saw Evergreen Cemetery in a movie. I was watching Sam Fuller’s 1959 film Crimson Kimono, much of which was shot on location in LA. * There’s a scene where a detective speaks with an elderly Japanese man in a cemetery. It stuck in my mind, and I got on the net to see if I could track the location down. It wasn’t hard. There’s a fair amount of information available on Evergreen Cemetery, and the more I learned, the more I wanted to know. 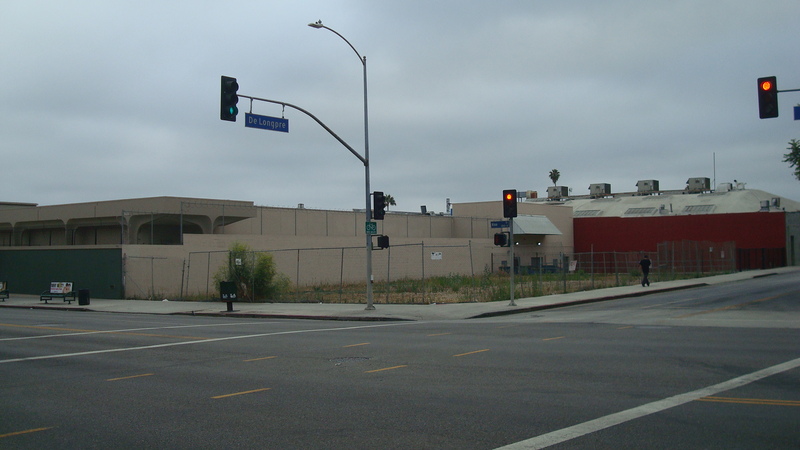 It was founded in 1877, and is located in Boyle Heights. Like every cemetery, it serves as a reminder and a record of the past, but it also holds a special place in LA history for a couple of reasons. First, it was unusual because in addition to serving the white community, it also served the African-American, Mexican and Japanese communities. Evergreen is an important reminder of the city’s multicultural heritage. Second, it’s the final resting place of a number of people who shaped not just LA history, but US history. 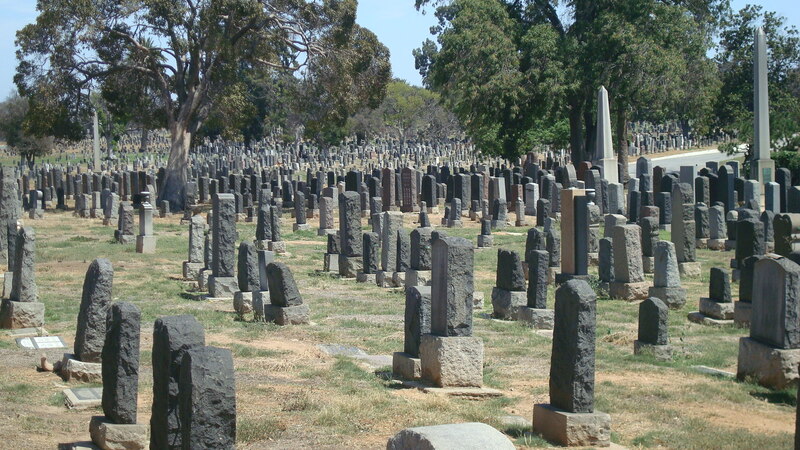 Tombstones belonging to actors, journalists, business leaders, war heroes, musicians, can all be found at this cemetery. Charlotta Bass, publisher of the California Eagle, an early black-owned newspaper, and vice-presidential candidate for the Progressive Party in 1952 is interred here. So is rancher and farmer Isaac Lankershim, who played a major role in the early development of the San Fernando Valley. You’ll find the grave of Earl Gilmore, who, after taking over his father’s oil company, expanded his business interests in many directions, and created the Farmers Market at Third and Fairfax. The cemetery holds a monument to the 442nd Regimental Combat Unit, made up of Japanese-American soldiers, that served with distinction in World War II. And there is also the Nineteenth Century Chinese Memorial Shrine, which was restored back in the 1990s with the help of the Chinese Historical Society of Southern California. Not too long ago, I went to visit Evergreen Cemetery with some people I know. There were a few others visitors, but most of the time it seemed like we were alone in this vast graveyard. The patchy grass was green in some places, brown in others. The sun was hot when we weren’t standing in the shade of the large trees. A few graves had fresh flowers on them. Many of them seemed like they hadn’t been touched in years. Aside from the occasional murmur of voices, or the sound of traffic passing on Cesar Chavez Ave., it was very quiet. Very peaceful. Below are a few links to sites I visited while researching the cemetery. The first offers a list of some of the people buried at Evergreen, and also provides a timeline. 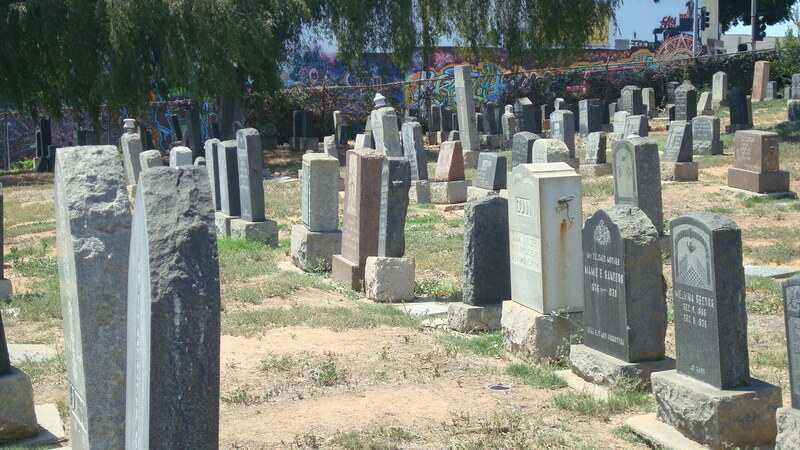 The second, from the KCET web site, gives a vivid and engaging account of the cemetery’s history. Plus it includes lots of cool photos. Last, a fascinating account of the Chinese Memorial Shrine. This story shows how an important piece of LA’s history was almost lost, and also how difficult preserving the past can be. 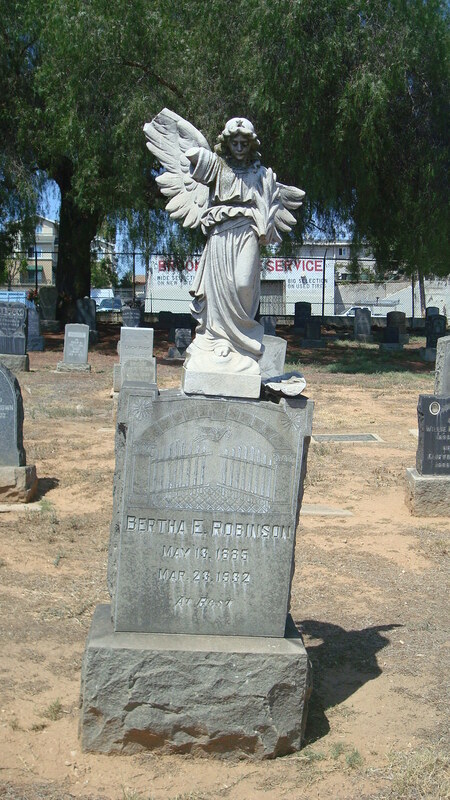 The majority of the location work for Crimson Kimono was shot in Little Tokyo, but Evergreen Cemetery is located in Boyle Heights. If you’re interested in LA history, the film offers extensive views of the city in the fifties, with a focus on the Japanese-American community. Hollywood is hot. Developers are jumping in with both feet. A number of projects have gone up in the last few years, and many more are in the works. My feelings about the building boom vary greatly, mostly depending on the quality of the individual projects. Some of them will definitely benefit the community, some I can tolerate, and others should never have gotten off the drawing board. Just recently Kilroy Realty unveiled their plans for a project on Vine, south of Sunset. Over all, I’m inclined to support it. As many people have pointed out, almost anything would be better than what occupies the site now. 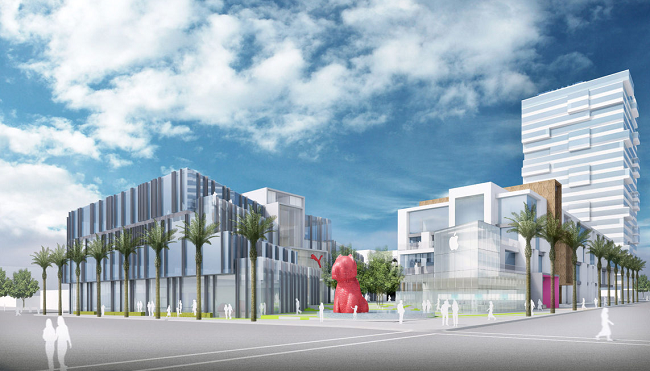 It’s an underutilized parcel, and Kilroy’s idea of turning it into a media campus makes perfect sense for the area. But I do have a couple of reservations…. 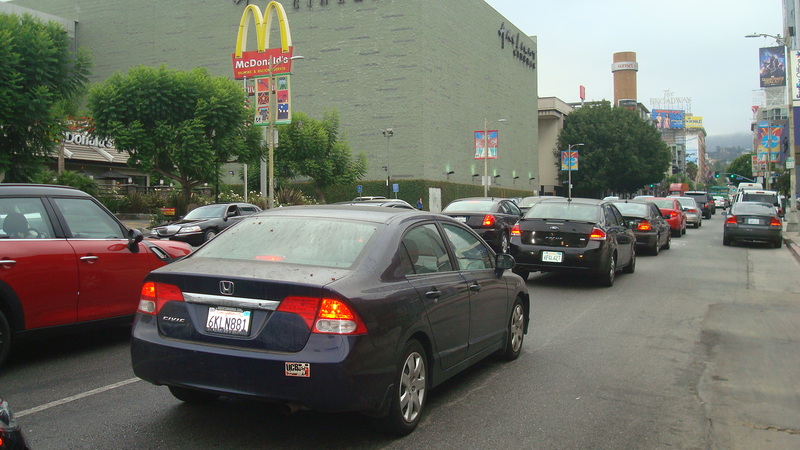 Anyone who’s lived in Hollywood for a while can tell you that traffic is steadily getting worse. This is especially interesting when you consider that the Hollywood area lost over 10,000 residents between 2000 and 2010. So even though there are fewer people living in the community, more of them are driving. It seems probable that this is because the low-income residents who were forced out by rising rents have been replaced by more affluent residents who are more likely to own cars. The Kilroy project will be continuing this trend, since the residential units are geared toward people who have money to spend. For those of you who don’t live in the area, here are a few photos of the northbound traffic on Vine on a Wednesday evening around 7:00 pm. These were taken at the corner of Vine and De Longpre, right across from the project site. Traffic on Vine, heading toward Sunset. Traffic on Vine, coming from Fountain. Same perspective as previous shot. Note that cars are not entering the intersection even though the light is green. This project will definitely be putting more cars on the road. What really concerns me is that it’s just one of many projects being considered for the Hollywood area. My point is that the City of LA needs to do a cumulative traffic study to plan for all this growth. The City argues they don’t have the money, which is ridiculous. They don’t have a problem throwing away millions of dollars on legal fees to defend projects that never should have seen the light of day, but they won’t spend a relatively modest sum to plan for a sustainable future. 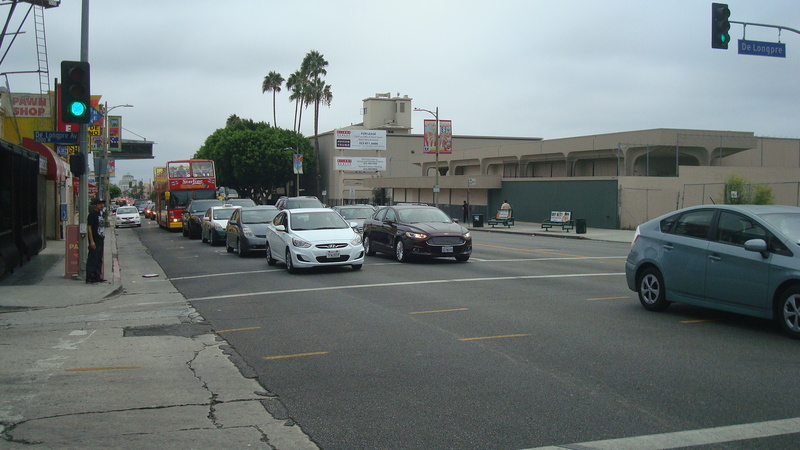 If Garcetti wants to push for big growth in Hollywood, he needs to start by springing for a cumulative traffic study that will help to lay the groundwork. Second, the residential component of the Kilroy project is definitely catering to the crowd that makes six figure salaries. Again, it’s not so much that I have a problem with this specific project, but the vast majority of the residential units that have been built in the area over the past ten years are geared towards the rich. You can’t move into places like the W, Blvd. 6200 or the Avenue unless you have money to burn. This push to make Hollywood a playground for the wealthy is driving rents up throughout the community. It’s not just the low-income working class families that are being forced out. The artists, musicians and writers who used to live in Hollywood are having to look for less expensive places. The desperate drive for gentrification is great for bringing in the trust fund kids who want to party, but it’s pushing out a lot of the people who really enriched the local culture. Over all, Kilroy seems to be making an effort to respect the community. This project is planned more or less within the current zoning laws, though the residential tower does go a little high. They’re including a fair amount of open space. It makes sense that they’re catering to media/entertainment companies, and, according to the LA Times story, there is a demand for office space in Hollywood. So my problem isn’t with this project itself, but the trend that it’s a part of. 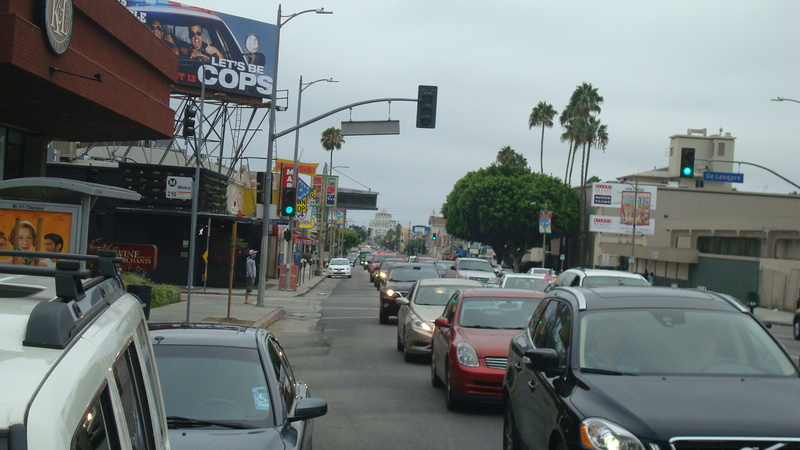 Hollywood is becoming more expensive and more congested. The mayor doesn’t care. He’s got a mansion in Hancock Park and a driver that takes him wherever he wants to go, both of which are paid for by the taxpayers. So naturally Garcetti wouldn’t be concerned about housing prices and traffic, since he doesn’t have to deal with those problems. Unfortunately, the rest of us do. If you want to take a look at the LA Times article on the Kilroy project, the link is below. 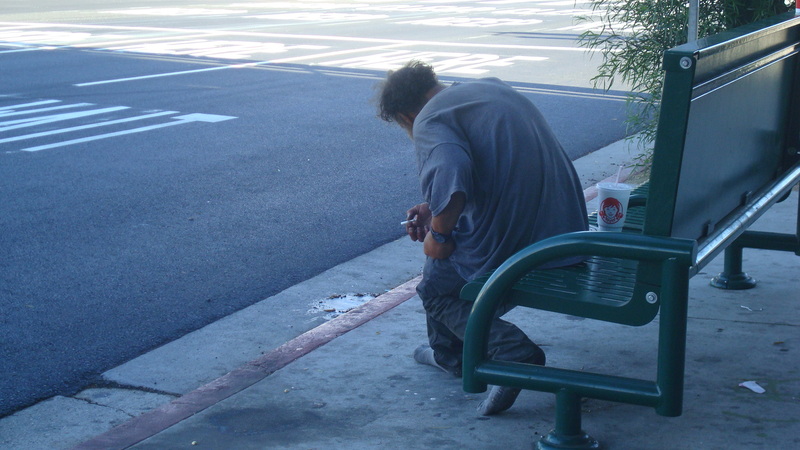 I was sitting at a bus stop on Sepulveda. It was late afternoon. There was one other guy waiting for the bus. A man came walking up. I’d say he was around fifty. He had a full beard. From his face it looked like he’d spent a lot of time in the sun. The blue T-shirt and grey pants were both faded. No shoes, just socks on his feet. He seemed to be looking for something. I took a quick look at the sidewalk. But then I turned to the right and saw something that looked liked a pack of cigarettes lying on the ground a few feet away. I pointed. He walked over and picked them up. He opened the pack and took one out. Then he offered the pack to me. The other guy didn’t answer. He reached into his pocket. Pulled out a small metal pipe and a cigarette lighter. He lit his cigarette and took a drag. ‘They used to have free concerts over there,’ he said. He went on to tell me about the bands that had played there. I said it sounded pretty cool. We went on talking aimlessly for a few minutes. Then he put the pipe to his lips. He held the lit end of his cigarette in the bowl. Took a drag. A minute later he put the pipe to his lips again, and this time he took a really long pull. Not long after that he started talking again, but now he wasn’t talking to me, and he wasn’t making any sense. He spoke in a low voice, and he just kind of rambled on. I couldn’t understand much of what he said. Slowly he started slouching forward. And then he kind of nodded off. The bus came and I got on board. As I was riding down Sepulveda, I wondered how many other people like him were wandering around LA on the Fourth of July. Lost, lonely people, looking for someone to talk to, looking for a place to watch the fireworks. 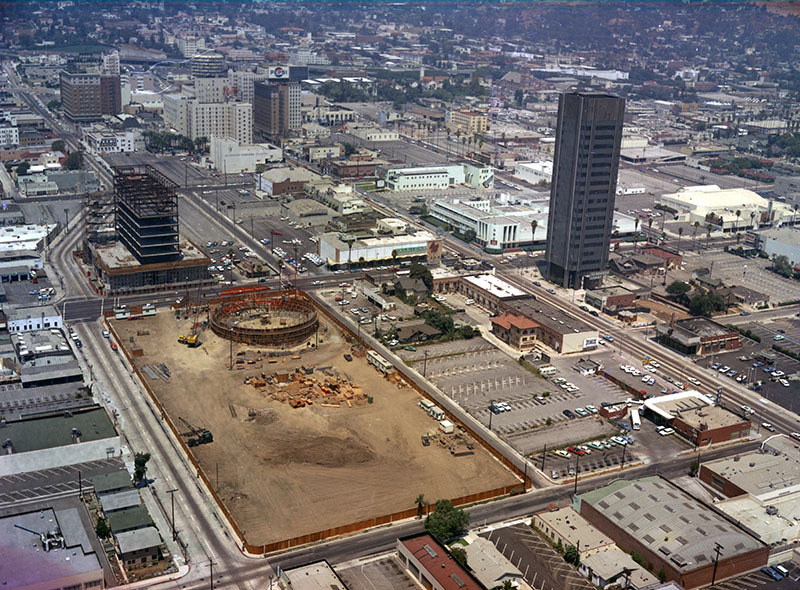 The Cinerama Dome under construction in 1963. 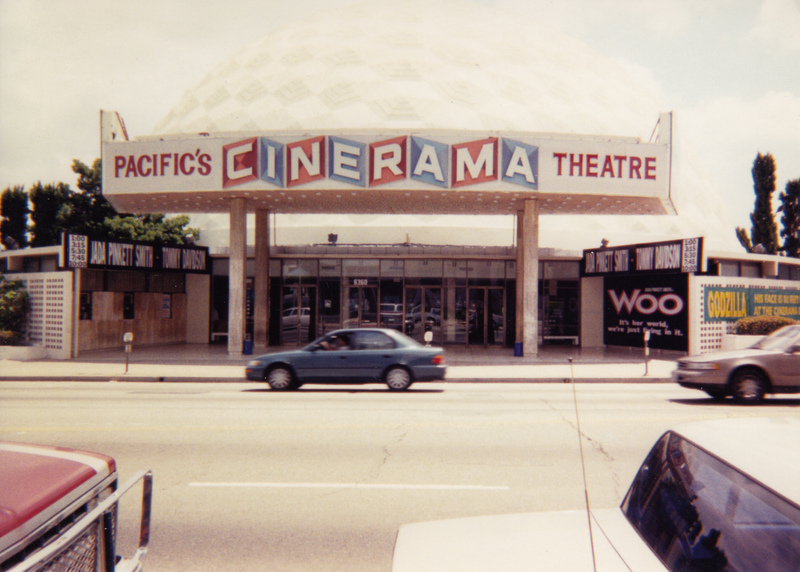 I spent a good part of 1998 freaking out over Pacific Theaters’ plans for “renovating” the Cinerama Dome. 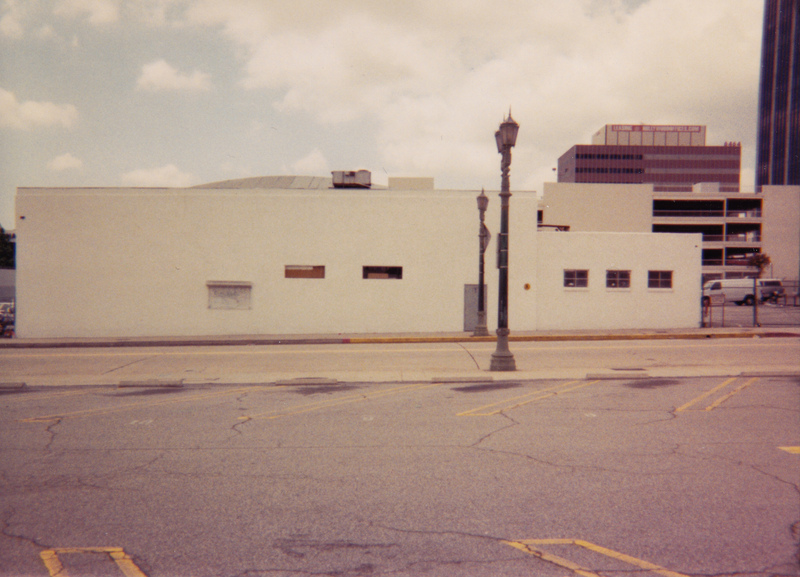 The initial proposal involved gutting the auditorium, removing the curved screen and putting a fast food restaurant in the lobby. The film and preservation communities protested loudly. To their credit, the people at Pacific met with the opposition and made a number of important concessions. If you’re not into film, and if you don’t care about Hollywood history, you might be mystified by the uproar. So let me offer a little background…. Cinerama was a process that revolutionized the production and exhibition of films back in the early fifties. Three strips of film were projected in perfect synchronization to create the illusion of a continuous widescreen image, accompanied by stereophonic sound playback. The image was shown on a huge curved screen to produce an early version of what we now call immersive entertainment. In the early sixties, Cinerama, Inc. unveiled an ambitious plan to create hundreds of Cinerama theatres based on a radical new model. They would construct geodesic domes using prefabricated panels, which would supposedly allow them to build a theatre in half the time and for half the cost of using conventional methods. They purchased a site on Sunset Blvd. in Hollywood and hired the firm of Welton Becket and Associates to design what would become the Cinerama Dome. The premiere of It’s a Mad, Mad, Mad, Mad World at the Dome in 1963. Becket’s company was one of the major architectural firms in the city at that time, and played a large part in setting the look and tone of mid-century Los Angeles. To my mind the Dome is something of a companion piece to one of their earlier signature creations, the Capitol Records Building, which is just a few blocks away on Vine. Together these two icons helped to define space age architecture. Of the theatres that were constructed to show films in the Cinerama process, only a handful are left today. The Dome is a unique creation designed by one of the most important architectural firms in the city’s history. That’s why so many of us got so crazy when we saw the initial plans to renovate it. I will always be grateful to Pacific for listening to the community and preserving the Dome. 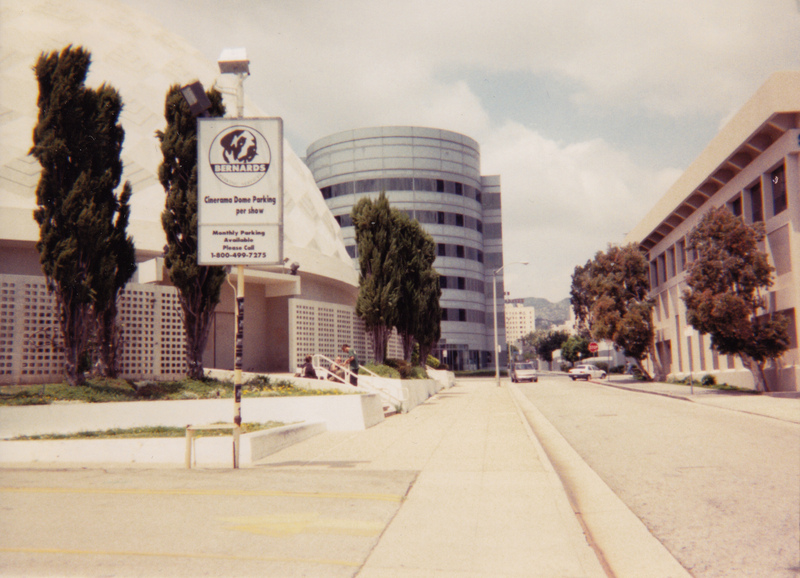 The two pictures above are from the Los Angeles Public Library photo archive. The first shows the dome under construction. It was taken by Howard D. Kelly in 1963. The second shows the premiere of the film that the Dome opened with, It’s a Mad, Mad, Mad, Mad World. It was also taken in 1963, but no photographer is credited. 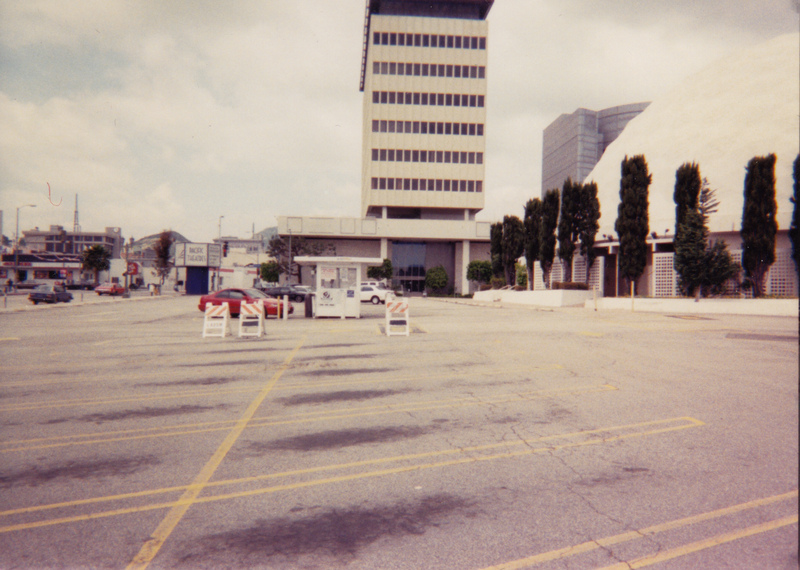 Below are some photos I took of the Dome and the area surrounding it back in 1998. Sorry that the quality isn’t better. They were taken with a disposable camera, and have faded over the years. A couple of photos were taken from Morningside Court, which used to go through to De Longpre, but was closed off with the construction of the Arclight parking structure. 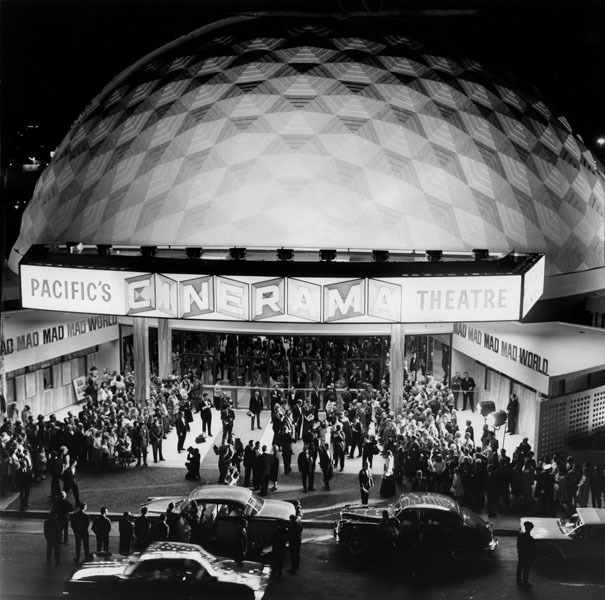 For weeks I’ve been meaning to write abut the latest on the Cinerama Dome. Here it is. Apparently the people from Pacific Theaters sat down and talked with the preservation people, and the end result was Pacific gave up a lot of the changes they were going to make. As I recall, these are some of the things pacific agreed to. The entrance will remain at the front of the theatre. The layout of the seating will stay basically the same, though they will be putting new seats in. They won’t alter the ceiling of the auditorium. They’ll keep the curved screen. I’m actually really grateful to Pacific for giving in on all this stuff. I doubt they understand why the Dome is such a great piece of architecture, so from their point of view the preservationists are going crazy over nothing. Of course, we still don’t know what the Dome is gonna look like when they’re through. But at this point I’m cautiously optimistic. 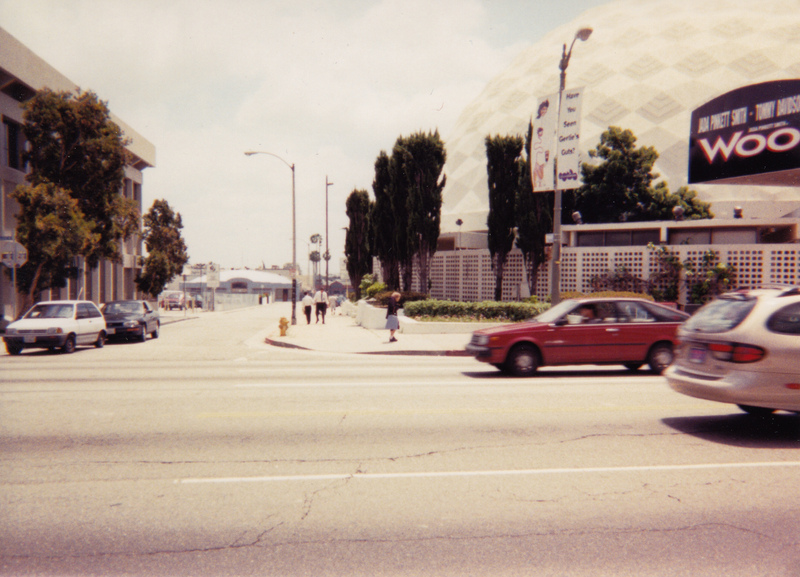 The front of the Cinerama Dome in 1998. 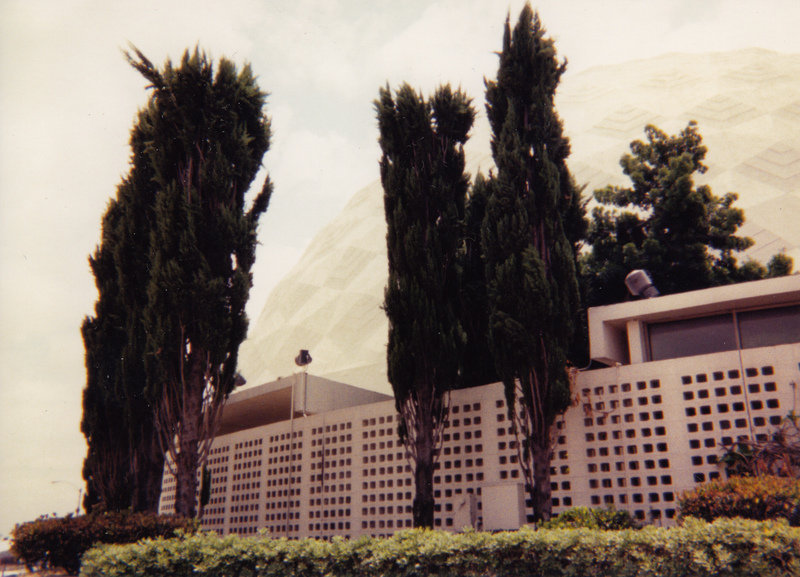 Screen walls and landscaping on the periphery of the Dome. A shot from the parking lot, looking north to Sunset. A shot of Morningside Court, looking toward Sunset. Another shot of Morningside Court, this time looking in the opposite direction towards De Longpre. This was taken from the parking lot behind the Dome, facing west. 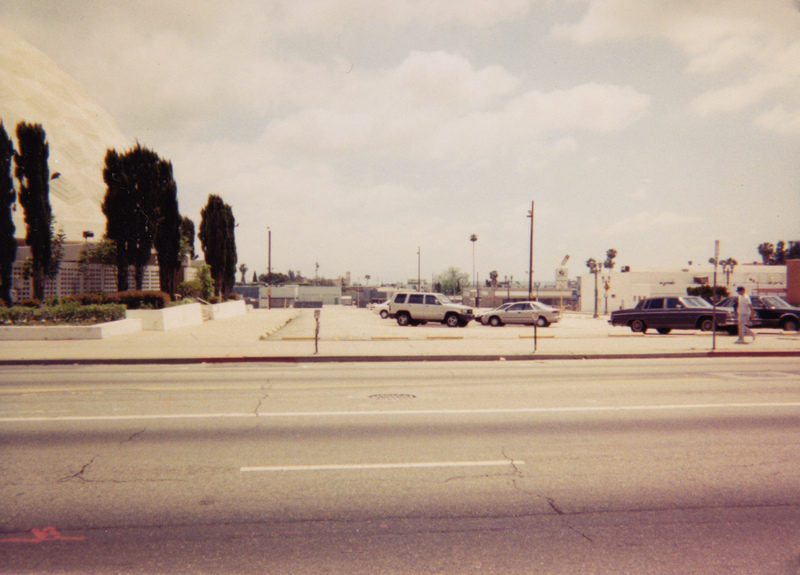 The site just across the street is where Amoeba now stands. This shot was taken facing the opposite direction, now looking across the parking lot towards Morningside Court.